FAS Vice-President Mr Lim Kia Tong (second from right) and Mr Simon Littlewood (third from left), President of Asia Now, the title sponsor of the AsiaNow Junior Indoor League officially launched the league at The Cage. Singapore Soccer Academy, an affiliated soccer academy with the FAS, had launched new tournament for the kids below the age of 12 - "SSA / ASIA NOW FIRST INDOOR JUNIOR LEAGUE". Develop the child’s technical and tactical abilities. Give the child as many touches on the ball to improve his thinking capacity in solving problems on the field. To create a winning mentality. To provide the child a fun learning environment. Foster bonding between parent and child. Promote a healthy life long sporting habit. Promote racial harmony by creating opportunities for interaction among the diverse range of participants and their parents. Each group will play an average of 10 matches with six teams in a group and participating teams will play on alternative Sundays at "THE CAGE", from 10am to 1pm. 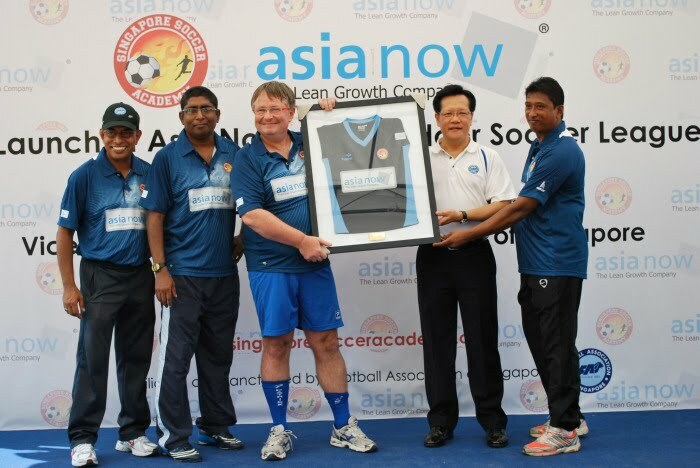 For more information such as fixture and schedule, please log on to http://singaporesocceracademy.com.